Blind and visually impaired persons find it very difficult to move about in unknown environments. The white canes used by them are still the preferred tools for orientation. The project "A Mobility and Navigational Aid for Visually Impaired Persons" wants to help visually impaired persons to orient themselves in new environments by means of computer-aided vision. For development of a smartphone software solution, the research group around Professor Rainer Stiefelhagen at Karlsruhe Institute of Technology (KIT) is awarded the US$ 83,000 Google Faculty Research Award. By means of a camera and mobile computer or smartphone, the system will recognize obstacles, evaluate the respective data in real time and transfer them to the user. In addition to identifying obstacles, the camera is intended to detect, for example, signals of traffic lights or find the way to the entrance of a building. The mobile computer will transmit such data by means of acoustic and haptic signals e.g., speech, alerts and warning signals or vibration. 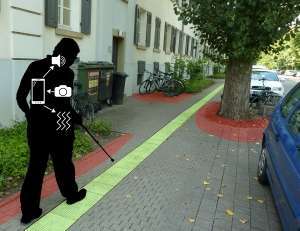 The technique will be implemented in a software solution for smartphones because these are widely used and easy to operate by blind persons. Popular smartphone software already includes options for screen content read-out by means of voice response and touch screen operation by blind persons through special gestures. It is also due to an ever-increasing processing power that smartphones are ideal for the intended system. In the medium term, first prototypes will be manufactured to be tested beforehand by visually impaired persons on the campus of KIT. Such on-campus testing is enabled by cooperating closely with KIT's Study Center for Visually Impaired Students (Studienzentrum für Sehgeschädigte – SZS) that supports visually impaired students during their studies and investigates new technical solutions for supporting blind and visually impaired persons. "We want our system to adapt to the particular demands of the prospective users already during its development," explains Professor Rainer Stiefelhagen who holds the chair of "Computer Systems for Visually Impaired Students" and is both head of the above study center and of a study group on "Computer Vision for Human-Computer Interaction".